Blue Moon Chicken Recipe - Gutom Na! Posted on Wednesday, March 8th, 2017 at 2:25 pm. Place chicken breasts on a cutting board skin-side up, and with the palm of your hand, press down. You want the chicken to be an even thickness so if the ribs crack, that is OK. This step assures even cooking but is optional. If brining, place all brine ingredients with chicken in one or two gallon zip lock bags and brine for eight hours or overnight refrigerated. One hour before serving, remove chicken from brine and discard brine. Rinse chicken then pat dry with paper towels. If not brining, continue here with recipe. Heat a large sauté pan or skillet over high heat and add two tablespoons of oil. Once smoking hot, place dry chicken skin down into pan, (be careful of splattering). You will need to do this in batches. Cook the skin side only for 3-4 minutes until the skin is browned and crispy. Remove to a platter. Reduce heat to medium and the remaining one tablespoon of oil and the scallion bottoms. Cook just for one minute. Add the beer to the pan to deglaze. Reduce by two thirds. Add orange juice, zest, soy and honey and heat to combine. Add all chicken back in skin side up and spoon a little juice over each piece. Cover and reduce to a simmer. Cook ten minutes, remove cover and turn each piece so skin now faces down. Cover and cook for ten more minutes. Insert a probe thermometer into the thickest part of the breast and if at 150 degrees F, remove chicken to a platter where it will continue to cook to 160 degrees F. If not, continue to cook until the temperature reaches 150 degrees F then remove to a platter. Depending on how large your chicken breast are, this may take more or less time. Heat liquid over medium high heat and cook to reduce by one third. Remove from heat and stir in the cold butter with a whisk. 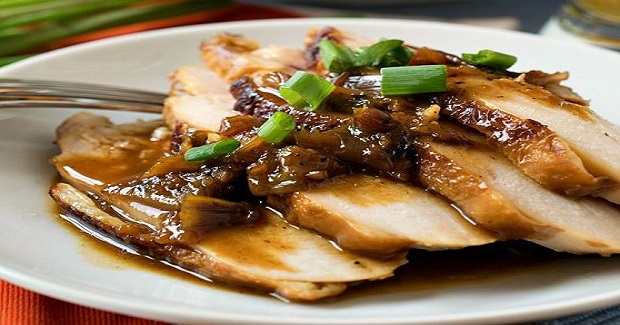 To serve, place sauce over each breast and finish with chopped scallion tops.